Looking For That Fun Pony Car to Cruise around in well here it is. 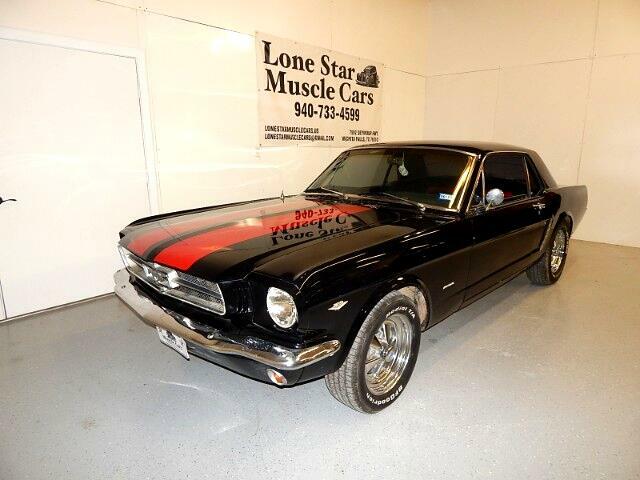 1965 Ford Mustang In Black Raven With Red Stripes. Powered By A 302 V-8 Motor And Four Speed Standard Transmission. This is the Car that started an Era of the pony car wars. On The Interior you will see a very nice Red And Black Custom Look From the seats to the door panels. Now this car has that old school look with the Classic Craiger Wheels. This Classic has an updated sound system and more. Call for more info. Message: Thought you might be interested in this 1965 Ford Mustang. All Payments Shown Are With W.A.C. @ 7.99 At 84 Months Outside Finance Source. Tax, Title, Registration Extra All Texas Residents T.T.L. Due At Time Of Sale. We Offer No In House Financing. See Dealer For Detail.